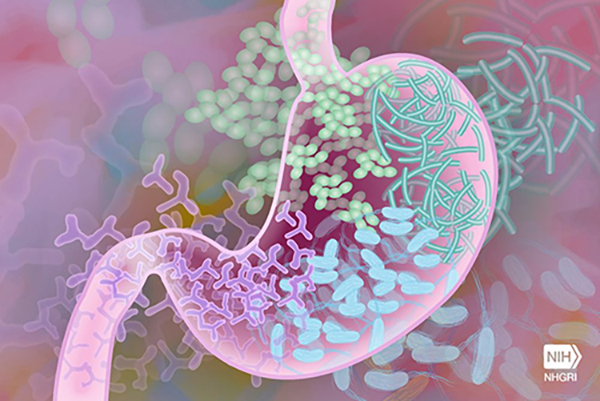 Home Insights The Gut: A Key to the Pathogenesis of Type 2 Diabetes? The Gut: A Key to the Pathogenesis of Type 2 Diabetes? In this communication we discuss the role of the gut for the development of type 2 diabetes mellitus (T2DM). Gastric emptying rates importantly determine postprandial glucose excursions and regulate postprandial secretion of the incretin hormones, glucose-dependent insulinotropic polypeptide (GIP), and glucagon-like peptide-1 (GLP-1). It thereby also determines their powerful, amplifying effect on glucose-induced insulin secretion and thus the ability of the body to regulate glucose disposal. Although disturbances in gastric emptying are not consistent findings in type 2 diabetes, the incretin system is seriously impaired, probably associated with insulin resistance and obesity. Both of the incretin hormones lose (part of) their insulinotropic activity resulting, together with (genetically) defective beta cell function, in the impaired postprandial insulin secretion of T2DM. In addition, glucagon responses are inappropriately increased and importantly contribute to both fasting and postprandial hyperglycemia. This may involve stimulation by GIP, but evidence also points to a role of circulating amino acids, which are elevated due to steatosis-induced impaired glucagon-mediated hepatic clearance, in line with recent work suggesting that the alpha cells and the liver are linked in a close, amino acid-mediated feedback circuit. Thus, the gut plays an important role in the development of T2DM spurred by overeating and defective beta cells. Hypersecretion of Glucagon in Type 2 Diabetes: Friend or Foe? There is, however, an additional factor which plays a rather important role: patients with T2DM typically have increased plasma concentrations of glucagon, both in the fasting state and postprandially.10 There is a general misconception that meal intake should lead to inhibition of glucagon secretion; on the contrary, most meals, in particular protein-rich meals, will stimulate glucagon secretion, but for patients with T2DM the increase is even larger.21 Because glucagon stimulates the hepatic glucose production, this rise has considerable consequences for the postprandial glucose excursions, as illustrated in experiments with glucagon receptor antagonists, which effectively lower both fasting and postprandial glucose levels.22 But what is the explanation for the elevated postprandial levels of glucagon in the patients with T2DM? Several mechanisms have been proposed and they may all contribute. First, there are probably signals from the gastrointestinal (GI) tract. Several hormones might be of importance, including GIP and glucagon-like peptide 2 (GLP-2), which stimulate glucagon secretion and GLP-1, which inhibits secretion. Their combined influence was investigated in a systematic study, where T2DM patients received intravenous infusions of each of these hormones (mimicking their postprandial plasma profiles) superimposed on an intravenous glucose infusion mimicking the concentration curves resulting from an oral glucose tolerance test.23Individually, it turned out, each of the hormones had the mentioned, expected effects, but infused together, the resulting glucagon secretion profile was very similar to that observed after oral glucose alone. Particularly GIP stimulated glucagon secretion. An increased activity of GIP might, therefore, contribute to the postprandial hyperglucagonemia in T2DM. This together with the loss of its insulinotropic effect in T2DM might therefore suggest that GIP actually has diabetogenic effects.24 However, it is also possible that the postprandial hyperglucagonemia is derived, not from the pancreas, but from the GI tract, where some of the endocrine cells, under certain circumstances, which may include T2DM, may be able to produce glucagon. This is clearly seen in individuals, after total pancreatectomy, who exhibit a large postprandial glucagon response after oral glucose.25 It can be demonstrated that the response has important effects for hepatic glucose production. Extrapancreatic glucagon may, therefore, contribute to the diabetic hyperglucagonemia. Is hyperglucagonemia in type 2 diabetes due to impaired liver function? One final factor deserves discussion: there is actually a fasting level of the hormone GLP-1, and it can be demonstrated, also in humans, that blocking of the GLP-1 receptor with a GLP-1 receptor antagonist (exendin 9–39) results in increased glucagon secretion, decreased insulin secretion and, presumably as a consequence of this, glucose intolerance and hyperglycemia in the fasting state.31 As already mentioned, the GLP-1 secretion is often impaired in T2DM, perhaps mainly related to simultaneously occurring obesity.11 Because the pathogenesis of T2DM also is associated with the development of obesity, a picture emerges where decreased GLP-1 secretion leads to both an impaired incretin effect and increased glucagon secretion, both with diabetogenic actions. As hepatic steatosis develops (because of increased calorie intake), the liver's sensitivity to both insulin and to the actions of glucagon on amino acid (and glucose?) metabolism will be impaired. Furthermore, parallel development of insulin resistance (because of ectopic fat) in the skeletal muscles results in impaired peripheral glucose uptake. Together, all of these result in a vicious diabetogenic cycle. As discussed in the above sections, many factors may contribute to the development of type 2 diabetes; however, it is clear that the gastrointestinal tract may play an important role. 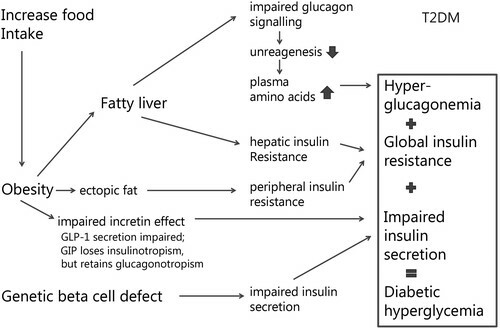 Thus, diminished secretion of GLP-1, and loss of GIP's insulinotropic effect may not only explain the inadequate insulin secretion, but may also contribute to hyperglucagonemia, both of which will promote glucose intolerance. In addition, increased intake of nutrients increases the risk of non-alcoholic fatty liver disease (NAFLD), and thereby impair glucagon signaling in hepatocytes leading to decreased ureagenesis and increases plasma levels of amino acids that in return stimulates the secretion of glucagon and causes proliferation of pancreatic alpha cells. This, together with (a) defective beta cell function caused by loss of the gut hormone-mediated incretin effect and genetic factors and (b) both hepatic and peripheral insulin resistance resulting from the increased nutrient intake, eventually results in overt hyperglycemia (Figure 1). Figure 1. The figure illustrates how increased food intake and a genetic beta cell defect interact with gut factors and hyperglucagonemia, induced by disruption of the normal liver alpha cell feedback cycle, eventually leading to diabetic hyperglycemia. Metabolic Syndrome and Related Disorders, published by Mary Ann Liebert, Inc., focuses solely on the pathophysiology, recognition, and treatment of this major health condition. The Journal meets the imperative for comprehensive research, data, and commentary on metabolic disorder as a suspected precursor to a wide range of diseases, including type 2 diabetes, cardiovascular disease, stroke, cancer, polycystic ovary syndrome, gout, and asthma. The above article was first published in the August 2017 issue of Metabolic Syndrome and Related Disorders with the title “The Gut: A Key to the Pathogenesis of Type 2 Diabetes?”. The views expressed here are those of the authors and are not necessarily those of Metabolic Syndrome and Related Disorders, Mary Ann Liebert, Inc., publishers, or their affiliates. No endorsement of any entity or technology is implied.